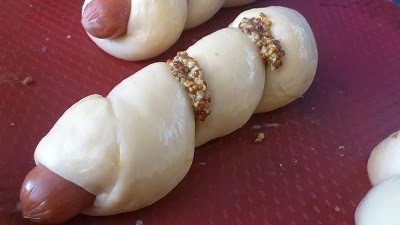 I don't know what to call it in English, but it is called Sausage rolls in Japan. I live in New Zealand, of cause, Sausage rolls is puff pastry stuffed with mince. I think it is common in US, UK and ...wherever. 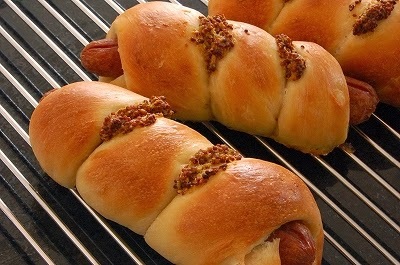 It is similar with hot dogs that is kind of sandwich served with grilled sausage. 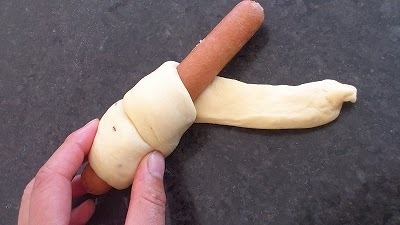 This sausage rolls that bread dough is tied around sausage, and baked in oven together. It is sold at bakery in Japan. I used to eat a lot when I was kid. It is nice when it is hot. I reheat it before I eat. 1. 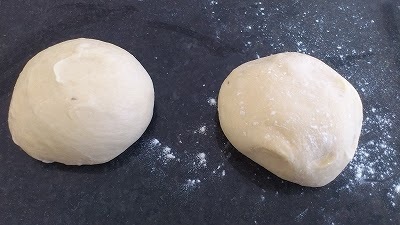 Combine dough ingredients except butter in to a large bowl. Knead it with your hand, until it becomes dough. Take it out onto the floured counter, knead it for 15 minutes until it gets elastic and smooth. Add butter, knead it until butter is just evenly incorporated into the dough. 3. Pour the dough on the floured counter, deflate it gently. Divide it into 8 pieces (100g each). Make them ball shapes. Rest them for 15 minutes. Set baking paper on the baking tray. 4. 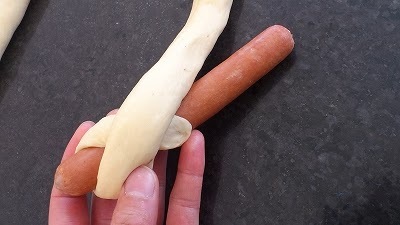 Shape them in to 30cm long. Stack the edge under neath the dough. 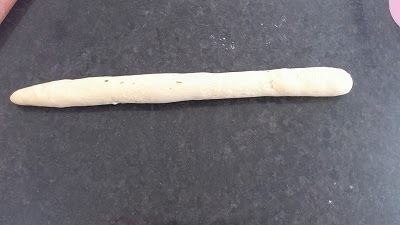 Make little bit space, the dough will proof. 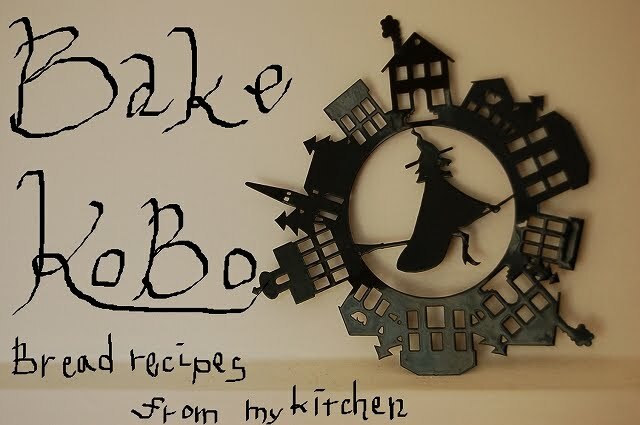 Place them on the baking try. 5. Place the tray with cover at warm place for 40 minutes until it they get bigger. 6. Preheat oven at 180℃. Decorate with tomato sauce or mustard as optional. 7. Bake them at 180℃ for 15-20 minutes until they get golden color. I just kneaded the dough but it feels tight and heavy... Am I doing it right? 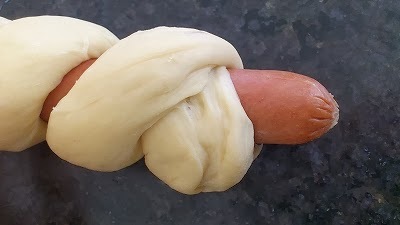 After adding butter, the dough should be soft. Did you add warm milk and water? 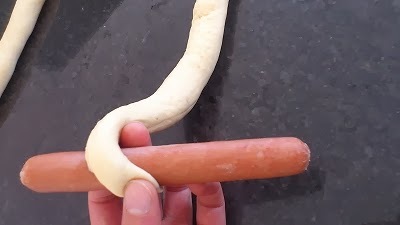 Is the dough cold? If it is tight and heavy, you could add more lukewarm water. Well even after butter.... But seems fine after proofing.. End result not a fluffy texture but its not hard as what I worry... Thank you... 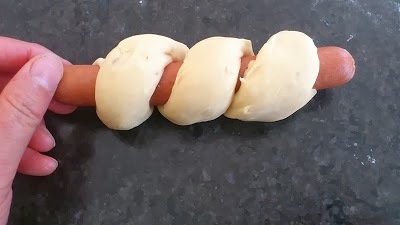 I've tried many different sausage roll recipe I can find in the web... Still in search of what I had as a kid... I'm in a humid country Malaysia. Any advice on the water ratio? Then add 155g water and 100g milk. I think it should be work.